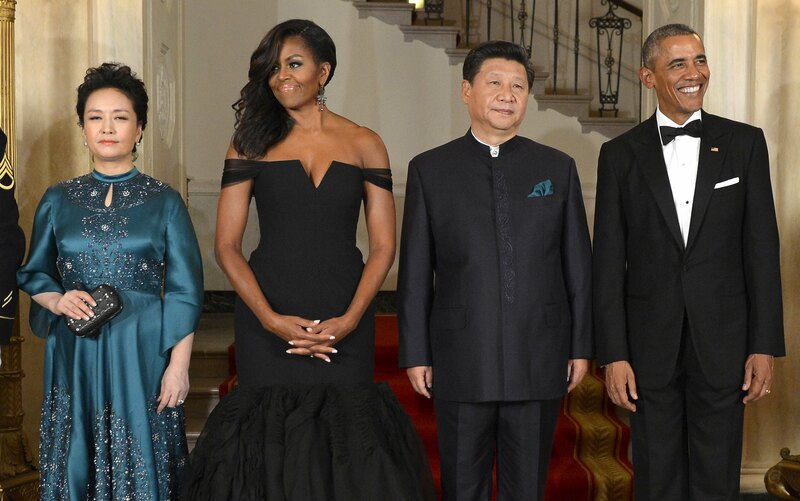 WASHINGTON -- President Barack Obama's lavish state dinner for Chinese President Xi Jinping was supposed to be the social release after a long day of business. The head table told a different tale -- bulging with the top brass from Apple, Microsoft, Facebook, Disney, DreamWorks and more. The 200-plus guest list for the Friday night soiree was a business-heavy mashup of Hollywood, diplomacy and corporate chieftains, with ballerina Misty Copeland's presence offering it a bit of a lilt. DreamWorks Animation CEO Jeffrey Katzenberg, part of the East Room's high-octane head table, was asked as he arrived whether the evening was all about business or pleasure. "Fun," he declared, but he added: "I hope." For more than a few guests, the dinner was a chance to build up some serious chits with Mom or other family members who arrived as dates. "Empire" creator Lee Daniels and R&B singer Ne-Yo, who performed later in the night, both brought their mothers. Clara Daniels, glowing in a coral gown, declared her date "my No. 1 son" -- but didn't specify if that was because he's the oldest of her two sons or because he came up with the dinner invitation. "I am the most proud mom," enthused Harriett Loraine Burts, mom to Ne-Yo. Then Burts looked for a way to escape the cameras, confessing, "I'm not good at this red carpet thing." As for how he scored the invitation to perform at such a high-powered event, Ne-Yo theorized it's because he's got some "Chinese in my heritage somewhere." First through the guest entry hall for dinner were former Labor Secretary Elaine Chao and her dad. Faced with the fashion-forward question "What are you wearing?" Chao seemed momentarily stumped. "Oh my gosh," she stammered. "It's something very inexpensive." Copeland, who breezed through in a strapless metallic gown, had a similar response to the same query. "I have no idea," she confessed. There was no question about first lady Michelle Obama's fashion statement. She wore a black, off-the-shoulder mermaid gown created by Chinese-American designer Vera Wang. Xi's wife, Peng Liyuan, also a fashion-savvy first lady, selected an embellished silk gown in rich aquamarine. The "wow" factor was lower-key among seasoned state dinner attendees but still there nonetheless. Former Secretary of State Madeleine Albright said she'd been to "many" state dinners, but added, "They're always fabulous." Chris Dodd, the former senator and current chairman of the Motion Picture Association of America, was asked if it ever gets old. Ninety-two-year-old Henry Kissinger, the shrewd diplomat who served under Presidents Richard Nixon and Gerald Ford, hustled through without stopping to comment, moving pretty quickly even with a cane. The decor in the big East Room included a 16-foot silk scroll depicting two roses that the White House said was meant to symbolize "a complete meeting of the minds." But all of that was largely glossed over in the dinner toasts. Mr. Obama said that while some differences were inevitable, he wished that the American and Chinese people may "work together like fingers on the same hand in friendship and in peace." Xi, for his part, called the state visit an "unforgettable journey" and praised the good will he felt from West Coast to East. Guests shuttled over to the State Dining Room for the post-dinner entertainment by Ne-Yo, who opened with "Because of You" and got guests clapping along. But more than a few attendees slipped out early, including Facebook's Mark Zuckerberg and his pregnant wife, Priscilla Chan. Guest chef Anita Lo, owner of Annisa in New York and a past "Top Chef" competitor, is a first-generation Chinese-American from Birmingham, Michigan. The culinary team created a menu that highlighted "American cuisine with nuances of Chinese flavor," according to the White House. Guests dined on wild mushroom soup, poached Maine lobster, grilled cannon of Colorado lamb and poppy seed bread and butter pudding. The dinner marked the midpoint of a daunting trifecta for the White House social team. Earlier in the week, they played host to Pope Francis. Next, they pivot to events the Obamas will host next week in New York, where the president will be attending the U.N. General Assembly.